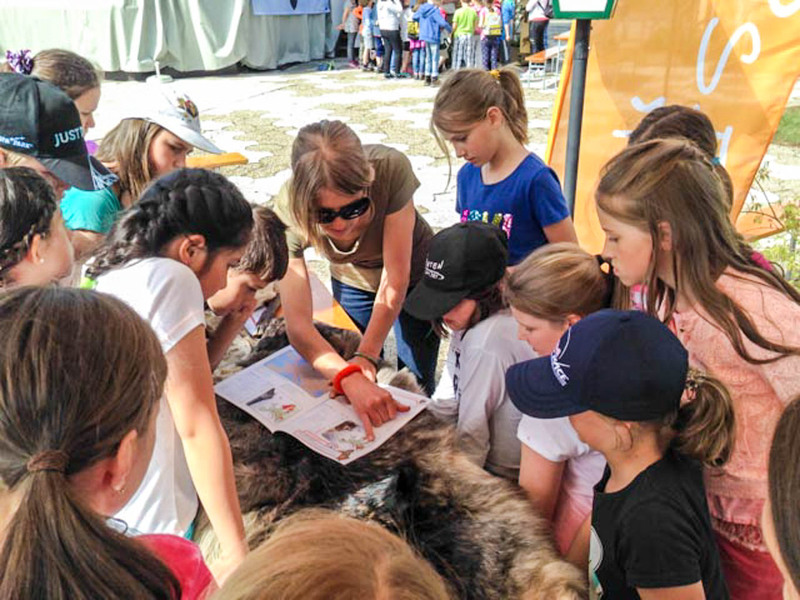 On 5th and 6th of May 800 school kids from the partner schools gathered for the school festival of the Hohe Tauern National Park around the bathing lake Uttendorf. Through play and fun the kids learned along several different coordination skills, handcraft or wildlife ecology. On the booth of the European Wilderness Society Gudrun Pflüger shared her knowledge about wolf, bear and lynx. Of great interest was the latest school magazine “Die Wilden Vier” (the wild four) by the European Wilderness Society and the kids took it home. The kids could also touch a real wolf fur, compare wolf foot prints, cut out their own wolf masks, compete with several wildlife species in a long jump competition, realizing that they can compete at most with a squirrel (3,5 m) but definitely not with the world champion in long jumping, the snow leopard with 14m. Concluding the experience was a howling and marking exercise.